Look who came to visit on Sunday!!! Nine month old Zoe!!! Isn't she a doll? She was just a little baby not too long ago! She finally got to ride on my back! She is such a cutie, I hope I get to see more of her! She is a doll! So cute! I just love the patient look in your eyes! Little Zoe is adorable and you look so happy to be with her. You are a sweet boy. Boy are you a lot bigger than Zoe. Zoe is so adorable! You are very lucky Dino to have such a cute friend! Those are very sweet pictures Dino! What a good boy you are around little girls! What a Cute post dear Dino!!!! hope your baby friend come to you asap again!!! We love you soooooooooooooo much!!! Zoe is very sweet and so are you to take such good care of her. Aw..Dino, she is just gorgeous! And you are SO good to let her ride on your back like that...a lot of dogs would get grumpy! You look so sweet together! Hi Dino! Aw, she does look just like a little doll. What a cutie! You sure were sweet with her. Hi Dino, you are such a good boy. 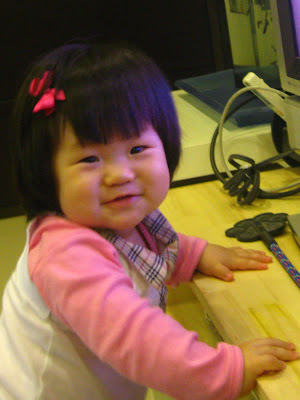 Baby Zoe is so cute....... :) Love. So sorry I was blowing raspberries and annoying you with that noise!!! I will try not to do that again the next time we meet but no guarantees .... I loved watching you walk about in your home, you are so fun!! I want to play with you again!! Oh, she is such a cutie!!!! I bet you are very comfortable to ride on. Hee! w00f's Dino, Zoe is a cutie!!! Glad you had a pawesome time with her! Your little friend is a doll. Hope you get to see her many times. What a sweetheart! Beautiful baby and a gorgeous Dino :) There is nothing sweeter than a kid and a GR in the same place! Aaw! She is such a cutie!! It's great that Dino is so good with her! And you are too, Dino! She is too cute! Did you give her lots of puppy kisses? Happy Easter to you from 2 miss golden Zitablue+ Cerise . A Pleasant Surprise from Brazil! New at Spree is Fun! They went to The Zoo without me again!